And I haven’t given up! Thanks to some great training, and a bunch of cheat sheets, and a lot of deep breathing, I’ve survived my almost first week with my t:slim. * I have a new friend and she’s a fabulous, patient, fun lady who happens to train people how to use the t:slim. * I absolutely adore just punching in numbers as opposed to scrolling numbers on the Ping meter or Animas pump. 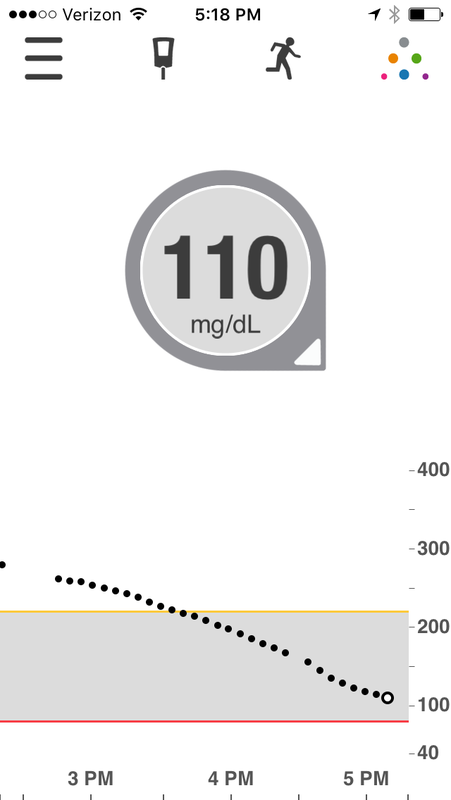 * I really, really like having my Dexcom screen on the pump. * That cute little insulin puddle with the splash screen makes me smile. * The clip. The pump fell off more in one week than my previous pump ever slipped off. So I fixed it. Sort of… Duct tape to the rescue! * The cartridge change has a whole lot of parts. * It sends the insulin VERY slowly through the tubing. Like really, really s l o w l y . . .
* But – it beeps when it’s done. Huh? What’s that beep? * Will Dubois wrote about this over at Diabetes Mine back in December, 2015. 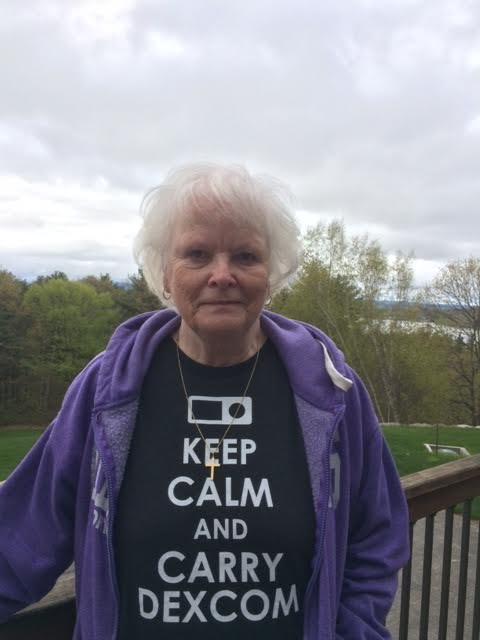 Ask D’Mine: How Speedy Is Your Insulin Pump? * And from my friend Laddie over at Test, Guess and Go, I remembered this quote, “Tandem pumps use a patented “Micro-Delivery” process and can take a couple of minutes to infuse a bolus.” So I wasn’t too surprised – sort of. * My clip trick? A couple of tiny strips of duct tape wrapped around the end. Hasn’t fall off since! Pumping with Tandem t:slim X2! The delivery! Look at all this stuff! I had promised the trainer that I wouldn’t start it up until she had been here. But, I played with the buttons. I copied all my settings to Diasend, printed them out for the trainer for the t:slim. I had ordered a pump skin earlier in the week from Tallygear.com. On Monday morning, I assembled all the stuff. Good grief! Wanting to dress appropriately for this occasion – I had to choose a d-shirt. Who knew that learning how to use a new pump could be fun? Erica, the Tandem trainer for up here in the woods – Maine, New Hampshire, Vermont – came to the house. We enjoyed lunch from a nearby deli and then we began. And then we hooked up Dexcom. Amazingly, my transmitter had been showing signs and warnings of departure (aka time for a new one), so we paired up a new one with the pump and my phone. Thanks Erica, for teaching me how to use my new t:slim! And this morning is a beautiful morning. Way back in 2009, in order to use an insulin pump, my endo’s office required a series of classes. I got to skip one class as I showed up with my Omnipod sample pod along with tons of documents about the other pumps available at the time. Thanks to the DOC – Diabetes Online Community, I was (at the time), the most well informed soon to be pumping d-patient they’d seen. And I knew I wanted the Animas. I’m so, so going to miss the remote bolusing from the Ping meter. I will really, really miss it. On Monday, a Tandem trainer is coming to our home to do the T:slim X2 start up with me. I’ve been good. I haven’t started it – yet. And to be honest, I probably won’t before we meet on Monday. I know, I’m a wimp. But – I’m a very organized wimp. I no longer have the Animas stuff on my computer after a lightning hit last summer – but got my pump settings downloaded using Diasend. I also have all my recent Dexcom numbers thanks to Clarity. I’m now a Medicare patient but – have enough Dexcom supplies to last me for a couple of months. So – I don’t need to order Dexcom stuff and so… Medicare won’t know/care that I’m using my iPhone to get my Dexcom info. That whole iPhone thing drives me nuts. We do not live close to an ambulance service. If I had an issue it would take awhile for help to arrive. Having the “Share” available so there are two of us to get any low alerts, helps keep me alive. My transmitter is almost dead but I have two in the box to go when ready. (I’m frugal and annoying.) I’m using expired/almost expired sensors and so far (knock on wood..), so good. Although – tonight it said I was HIGH (I’ve never seen that) (see those two dots up there at 400? NOT!) when the number was around 120. Did a couple of calibrations and it seems to be settling down. And this evening? Well – the snow is gone, the Official Ice Out – a VERY big deal up here on Lake Winnipesaukee – has been announced and we were able to enjoy a cocktail on the porch. Life is good. I’m getting ready to transition to Medicare – and that scares the sh*t out of me. I NEVER thought I’d be working at my age. We both worked hard to make it possible to retire and enjoy our retirement. Diabetes brought that to a screeching halt. For new d-friends, I was dx’d at age 55. I’ve said I’d give up my pump before my Dexcom if given a choice. I know they’re approved now but – it looks like there will be some bumps before it, Dexcom, is totally available. And… it truly and honestly bothers me immensely that there are people who are not able to afford the d-medications that they need to stay alive. Give me a break. NO ONE should be denied medications needed to STAY alive. PS – I truly LOVE comments and I know everyone else does, too. But… I’m going to do comment catching up after D-Blog week. If I do comments now they’ll all say, “Nice!” or “Thank you for posting this.” I’m really looking forward to meeting new bloggers and catching up with some of “been around for some time” bloggers. Click for the Language and Diabetes – Wednesday 5/18 Link List. I used to worry about the words. I’m old enough now that most of the words don’t bother me. So for today, I’m going to go spend some time reading and commenting! Those two words (ok – those five words) are on my mind every single day. Have you contacted your state government officials to let them know that it’s VERY important that Medicare approve CGMS’s? Please take the time to do that. Please? Follow this link. And thank you! And – as much as I love comments – given a choice, please follow the link and contact your state’s government officials and SKIP leaving me a comment. We each got a Fitbit for Christmas. When you’re older and there’s no you know who, you go to the store together and buy the presents. (BB&B Coupons!) He is way ahead of me when it comes to the steps. I’m even on the treadmill (yes, again) (I dusted it off) and he’s still ahead. I just heat sealed/bagged 4 dozen plus cookies. I don’t want them to go bad and I’m sure they’ll be a yummy treat in the greyness of February. Shoveling snow is good for my blood sugar. Eating the most incredible chocolate chip cookie – which I’ve decided might be around 35/40 carbs – destroyed the joy of shoveling. But it was worth it. I’m looking forward to a quiet New Year’s Dinner with friends. It’s an early dinner and in all likelihood – we’ll be asleep long before midnight. I like using Dexcom G5. I like using the iPhone as my receiver because – if I misplace it, I just have to call it. I silence the iPhone at night and use the Dexcom receiver to beep and do the “shake, rattle, and roll” thing. If my parents were still alive, today would be their 67th wedding anniversary. They were pretty awesome parents! My grandmothers and my parents. My grandmother on the right probably was a Type 1 Lada, before there was such a thing. She was diagnosed in her 20’s with “adult” diabetes. I did it. I ordered the Dexcom G5. I have it. I just did the fake “Yes, I inserted a new sensor.” this morning so it’s been one whole week! I leave the receiver at home while I’m at work. I only have to find my phone and that’s not so bad since I can call it if I lose it. And hope that I haven’t shut off the ringer. I’m still figuring out some stuff. I still don’t have a clue how Diasend is going to work. Or even if it works. Clarity works – automatically from the phone so that helps. Phone staying charged hasn’t been too bad. I bought new, longer charging cords for the bedroom for each of us so that we’re not having to unplug it just to look at it. M’s had more no info issue than I have. He’s on as a follower/sharer. I’m not sure what the problem is (or what I did wrong…) but it’s been better the last day or two so maybe it’s not a problem. I wish. I’m using the receiver at night and putting the phone on vibrate. The receiver is in a glass dish on my nightstand. I almost always hear it so, it works. I had a couple of questions and ended up speaking with a CDE at Dexcom. She was very helpful – has Type 1 – and wears a pump and Dexcom. I’ve said this before – I may have written it before but… If I could only have one D-machine, I’d choose Dexcom. Keep writing those letters to your representatives and senators. We need Dexcom and other CGMS to be approved (and paid for) by Medicare. And it’s not just those of us of a certain age that need your help with this. Medicare approval helps all of us when it comes to having and using a CGMS that’s provided by insurance. Wishing everyone a Merry Christmas or a Happy Holiday or a Nice Day. Whatever make you smile and feel good!